I shared my Christmas mantel with you a couple of days ago. and spread it around the rest of the room. I sewed the white dotted & the green pillows myself. All the others I bought. I made another paper circle garland to match the one on the mantel. 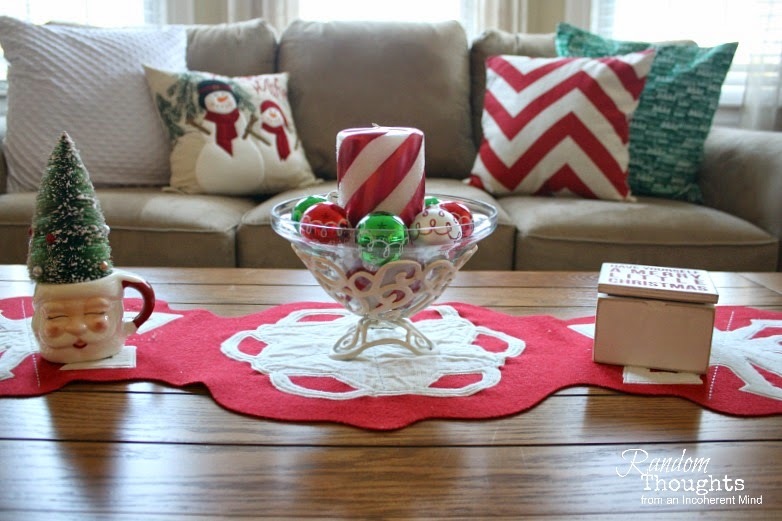 I love that candy cane striped pillar candle! 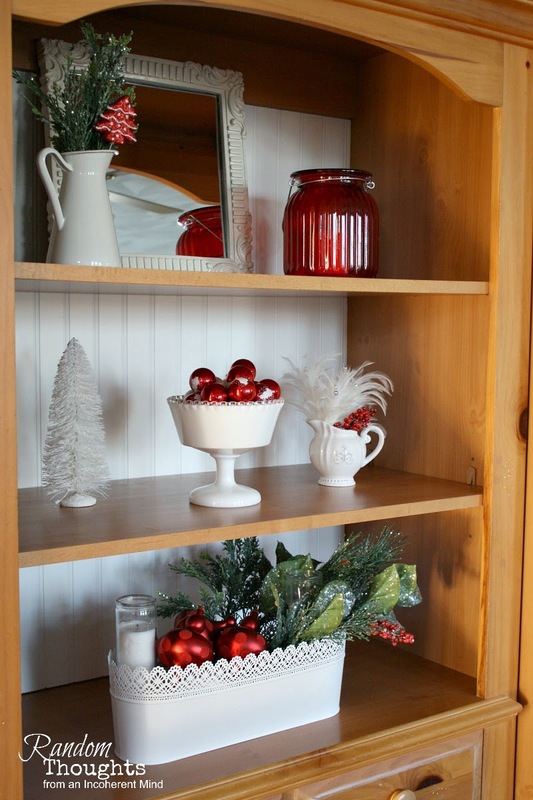 I decorated the living room shelves in the same colors. I hope you enjoyed my living room tour. I enjoyed having you here. so please stop back when you are able. Your room looks really nice. I like the red and white theme. Gina I loved that first photo...everything looks so pretty!! Gina, it's beautiful. The red just pops. Love your pillows ... so festive and your tree is is so pretty. Still lovin that giant candy cane! Oh my word, Gina- this should be in a magazine, seriously! It's cover shot perfection! LOVE it! 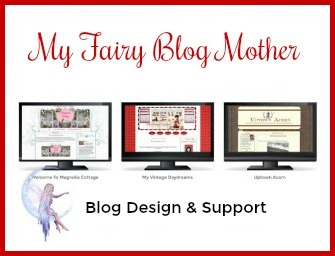 Hi Gina, I just love your candy cane theme! 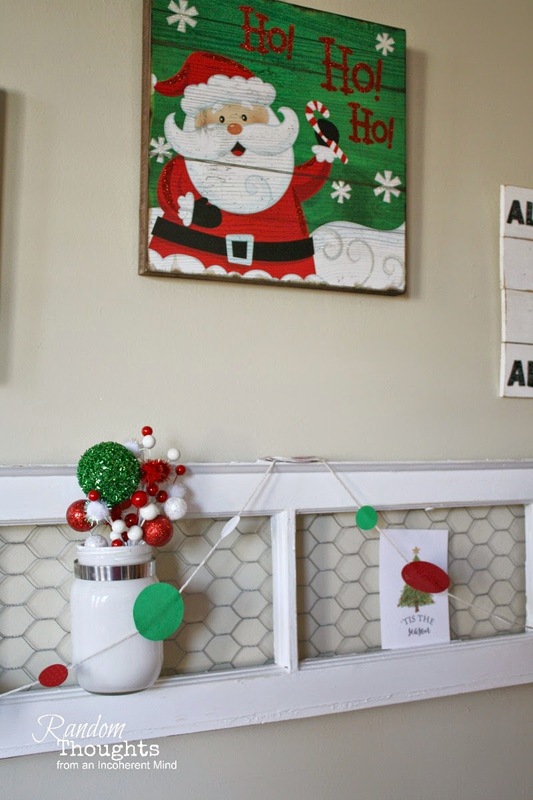 Everything is so cute and festive, and I adore the garland that you made for your mantel. Love all of your Christmas pillows, too! Looks like you're ready for Christmas! It looks like you are all ready! Everything looks so festive. I hope you and yours have a blessed Christmas! Love the candy theme Gina, great work on those pillows too! Love the garland so Christmasey! This is just wonderful, Gina...I love the candy cane theme! How neat that you made the pillows. I really love your mantel, too. So lighthearted! I think you chose the perfect theme for your room, Gina! The tree looks fabulous, and the pillows are so cute! 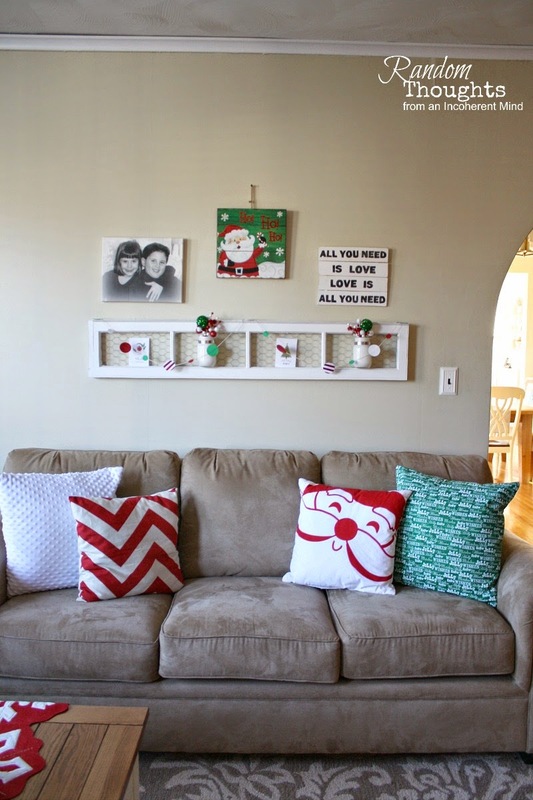 Your living room looks so festive, fun, bright and happy, Gina. It has so much of your own fabulous flair. Hi Gina! I love your mantel. The Santa sign is adorable! 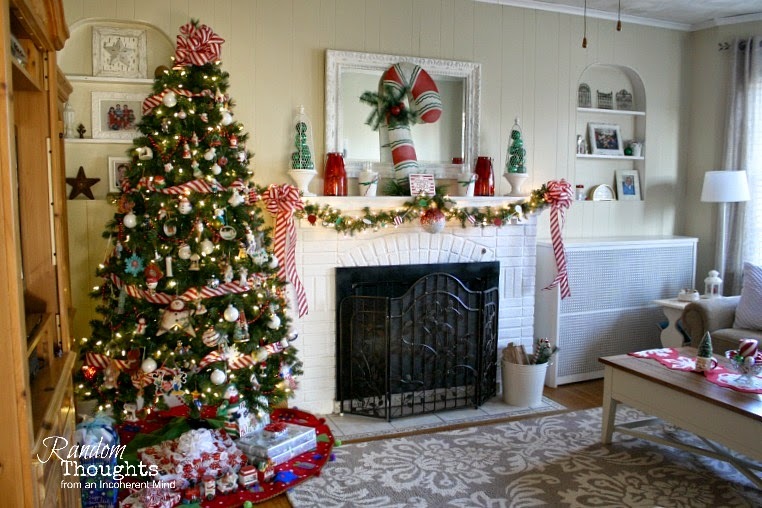 Your room looks great Gina and the red n striped bow at the top of your tree makes me think of a great big present!! Fun and whimsical. Pillows are one of my favorite things! Great job girl!! 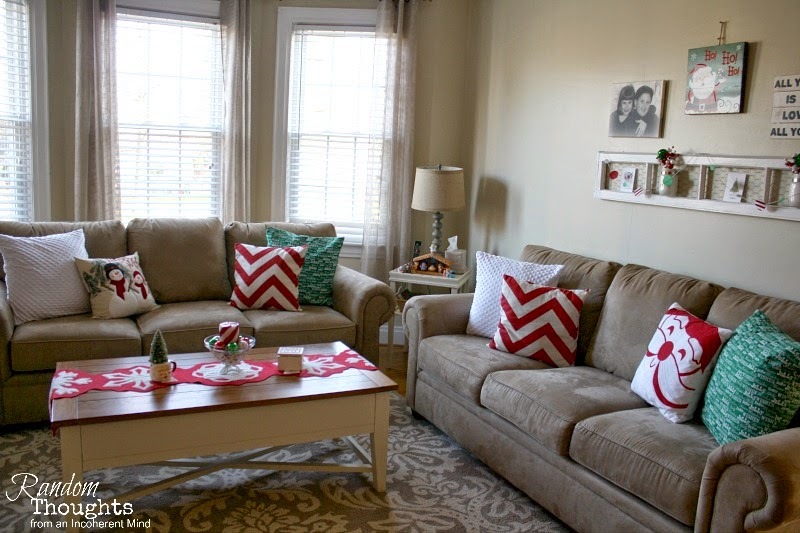 Nice job on the pillows.. they really add a pop of color, and continue the theme of your décor. So glad to hear from you again, it's been too long. 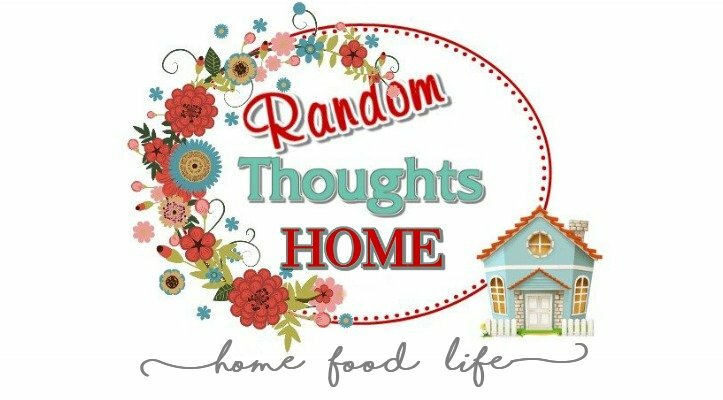 Missed your posts, love seeing all the wonderful things you do in your home. 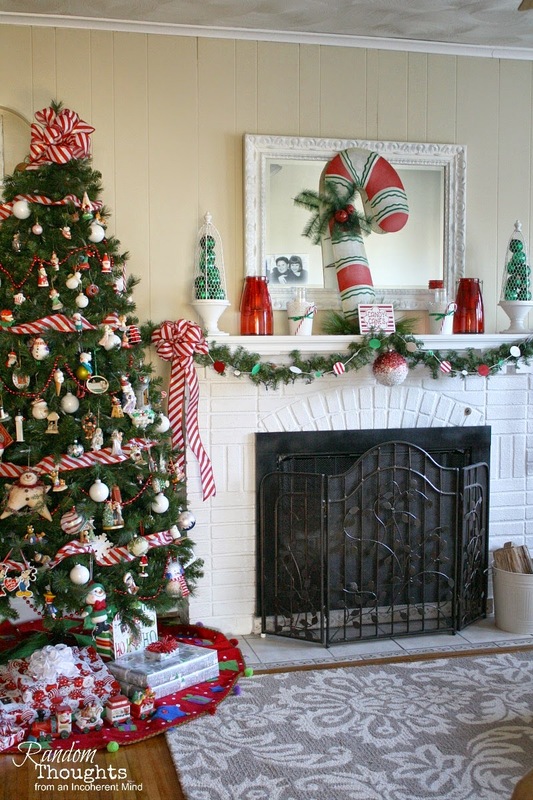 Your mantel is sure one of them, the red/white is so clean and pretty while being Christmas festive. Love all your holiday decorations. You always did such neat things, your new pillows you sewed with purchased ones are perfect, lots of pretty colors but not too much ever. Hope you're enjoying the season, hard to believe it's only 14 days til Christmas, seems to fly by. It is gorgeous, Gina! Your room looks sooo pretty! The theme is just perfect.